Would you pay hundreds of thousands of dollars for a crystal orb that says Final Fantasy on it? Back in 1987, a game called Final Fantasy was released for the NES and it was the start of one of the world's most popular videogame franchises. In 1990, a Final Fantasy Treasure Quest contest ran in Nintendo Power magazine that gave readers a chance to win a crystal Final Fantasy orb. Ebay seller felixollie was lucky enough to win, and is now trying to cash in big time. 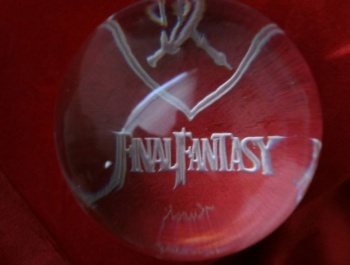 The orb is etched with the Final Fantasy name and its sword, shield, and axe logo. Felixollie's starting bid asking price is a mere $250,000, but if you want to forgo the auction process you can buy it now for a cool $1 million. This might seem like a lot, but it's really worth it. The orb is made of solid lead crystal, and it enables you to cast Ice3. You'll want to be careful though, because four elemental fiends are currently after the orb and will tear your heart out of your face to get it. Felixollie was one of only 50 winners, definitely making the orb a rare collectible. I'm just not sure that someone wants to pay a quarter-million for it. I'm actually completely sure nobody will, even though it's in perfect condition. When a box of Nintendo cereal can go for $200, it is still anybody's guess what the orb would be worth to someone. But when ultra-rare games are selling for $41,000, it's unlikely that a magical crystal from the days when Final Fantasy was king will go for even close to that. Good try, though.